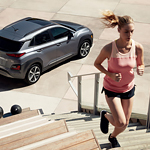 The Hyundai Kona is a popular small SUV that continues to turn heads on roads everywhere with its impressive performance features, expertly crafted exterior and interior styling, and the distinct choice of powertrains. The Kona enthusiasts at Hyundai Of Cottonwood are ready to answer any questions that you have about how this venerable vehicle can meet all of your automotive needs. The Kona offers its drivers the choice of two unique powertrains. The 2.0-liter 4-cylinder Atkinson engine delivers 147 horsepower partnered with 132 lb.-ft. of torque. This engine is mated with a six-speed automatic transmission. Or for even more power, drivers can select either the Limited or Ultimate trims. Both of these models feature the patented Gamma 1.6-liter 4-cylinder direct-injected, turbocharged engine. This motor boasts 175 horsepower at 5500 rpm along with 195 lb.-ft. of torque from 1500-4500 rpm. These impressive numbers set the Kona apart from other vehicles in its class.